Just a reminder to be ever vigilant in your browsing for Swine/Mexican/H1N1 flu information. We show over 1000 new domains containing those keywords registered in the last 24 hours. One of our regular contributers has been tracking Conficker related P2P traffic for the last several weeks. Oddly, from their point of view the traffic dropped off to near nothing around 8 PM GMT on April 30th. We have not heard of any change in Conficker behavior from any of the usual Conficker sources. If any of you noticed any Conficker related changes in the last few days we would love to hear from you. Today one of our Handlers notice an interesting anomaly in the Dshield data. 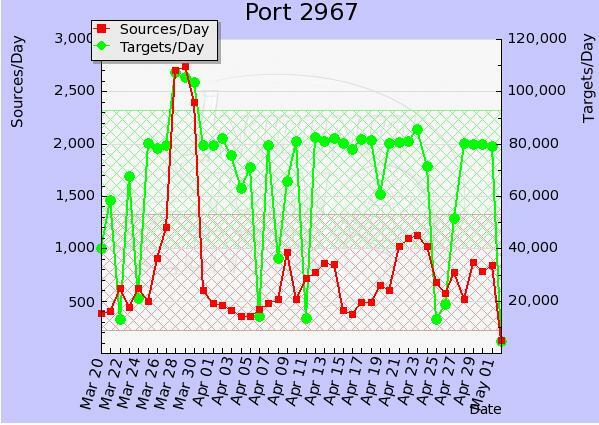 Since late March Dshield has seen a significant increase in the number of sources using port 2967 for scanning. Traditionally there has been some activity on this port, but in late March the number of sources increased approximately six times and the number of targets increased by about 50%. After a few days the sources settled down to about double the traditional value. Most likely this has something to do with the recent Symantec vulnerabilities, but we here at the ISC would be interested in any insight anybody can shed on this activity. We would be especially interested in packet captures from traffic of this nature. If you have any information that may help, please contact us.